Choose from our collection of baby blankets including polar fleece, knitted, cotton and our exclusive double sided soft velboa. Design your own personalised baby blanket - add baby’s name and date of birth to make a unique new baby gift. Our best selling Fleece Baby Blankets are available in four colours with a choice of embroidered motifs. Next Day Delivery Available on all blankets. Soft, luxurious taggy comfort blankets handmade to order from our carefully selected range of plain and patterned fabrics and satin, patterned and textured ribbon tags. Design your own personalised taggies blanket - add baby’s name and date of birth to make a unique new baby gift. MyTaggies blankets are CE marked and machine washable. 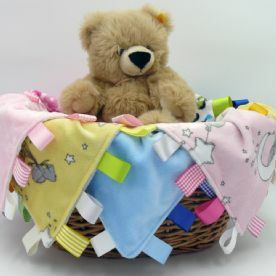 MyBlankets.com are a UK based family run business creating personalised baby blankets and taggies blankets since 2005. Our hand picked selection includes products from leading brands recognised for their design and quality. 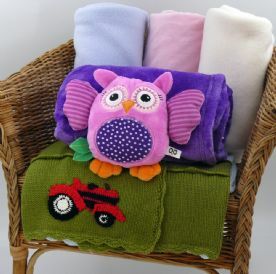 Our personalised embroidered gifts for babies and children include blankets, comforters and towels. If you are searching for a unique new baby, Christening or babyshower gift then our personalised baby gifts are a perfect solution. We provide a free gift message service and gift wrapping is available for a small additional charge. Most items are available from stock and can be embroidered and dispatched for next day delivery if required. Please do not hesitate to contact us if you have any questions regarding our products, availability or delivery times.